So you have a little girl who wants a Disney Princess bedroom and you want to give it to her – what do you do? Well first you have to decide on a budget and exactly how far are you going to go. Do you get new furniture and paint/paper the room or are you going to keep to more cosmetic changes like soft furnishings and accessories? Whichever way you want to go this page will help you design the best Disney Princess bedroom for your own little princess. A very important question is does your princess have a favorite Disney Princess? If she does then we’ll want to style the room around them, but if she doesn’t that’s okay we’ll still make her a fabulous bedroom. I should add a warning that she may never want to leave her own little Kingdom once you’ve finished! As with a lot of little princess the Disney Princesses seem to prefer the color pink on the walls, although a pale purple color can look good as well. Now to be perfectly honest when my daughter was into the Disney Princesses we were in rented accommodation and not allowed to paint the walls which were in a neutral cream/beige color and we achieved a very good look. Now on your walls you could accent them with stickers, wall appliqués, wall murals, wallpaper borders and tiles. The other thing which is really important when it comes to ‘setting the scene’ is artwork. Now a little tip that I’ve found helpful over the years is to buy a couple of nice frames (not to girly or young, but a plain silver, black or wood color) and add a couple of posters into them. These frames can be used as she grows up and goes through other stages such as Bratz, Hannah Montana, iCarly, right up to Justin Bieber and One Direction. Most little girls dream of being a princess which is part of the attraction of the Disney Princesses. Here you will find some lovely Disney Princess posters which the little girl you love will absolutely adore. Now I would keep to a neutral colored carpet or wood floors and just add rugs for the Disney Princess flair. There's quite a collection of Disney Princess rugs available for you to choose from and I've added two for you to look at opposite. If you have enough of your princesses favorite Disney Princesses represented elsewhere in the room however you can even get away with a totally different type of rug. Think outside of the box with ideas like sheepskins and shaggy rugs - a sheepskin rug can add a touch of luxury to the princess’ domain whereas a funky shaggy pink rug can add a different texture into her room. Either one of these ideas will work really well. Disney Princess Children's 'Hearts' Bedroom Rug 3ft 1" x 4ft 4"
Hand washable Disney Princess children's rug is ideal for a Disney Princess Bedroom. Disney Princess Childrens 'Icons' Bedroom Rug 3ft 1" x 4ft 4"
Now obviously you could purchase a Disney Princess bed and there are a number of variations of these on the market, but you can also achieve a great look by using a white bed. Having a white bed you can use bedding and accessories to achieve a princess look without having to buy a new bed when she moves onto something else. Just between you and I they do change their likes pretty quickly so staying neutral is sometimes a great idea!! Now onto what is on your princesses bed, there are a lot of different options for bedding from using just her favorite Disney Princess or having a combination of them on her bed. When you can by a combined comforter and sheet set that is fantastic, but where you can’t I would buy a comforter or quilt cover and use a plain sheet set in an appropriate color. As an example when my daughter had her Dora the Explorer quilt cover I brought two sheet sets a plain pink one and a plain purple one. These sheet sets were able to also be used with a Disney Princess quilt and a Bratz comforter and are still being used on a (apparently) grown up gingham print comforter. Another option is to use a plain colored comforter and sheet set and add a Disney Princess fleece blanket over the top, pop a couple of Disney Princess throw cushions onto the bed as well and your daughter will think she’s in heaven. If she decides to get upset before going to bed one night because Disney Princesses are stupid (harsh words, but they have been said by a grumpy pre-schooler who doesn’t want to go to bed in the past) then all you have to do is remove the blanket and cushions and there are no excuses for your ‘big girl’! Check out this page for all of your Disney Princess bedding options. 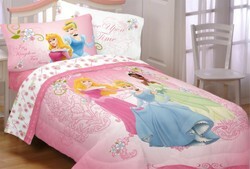 The soft pink coordinating comforter features, Sleeping Beauty, Cinderella and Tiana. This soft 100-Percent polyester microfiber comforter is machine wash and dry. There are a number of different Disney Princess drapes that you can hang which will really make an impact on your little angel’s room. I actually prefer to use blinds however, because with the black out blinds it stops my daughter from waking up at five in the morning! If you’re the same as me you’ll be happy to know that there are a number of window valances to choose from. Make sure you have a neutral colored blind and pop the Disney Princess valance above it and you’ll make your own little princess very, very happy. The Princesses Damask Dreams 63-Inch drape features Sleeping Beauty, Cinderella and Tiana floating on a pink ground drape. There are a number of things that you can add to a child’s bedroom to turn it into a Disney Princess room from switch plates over the light switches or bedside lamps. An absolute must for any princess is a jewelry box and there are some beautiful Disney Princess jewelry boxes that you can add to a room. Disney Princess photo frames are another nice accessory that can help turn a room into a realm. Cushions, chairs, dressing tables and more are all great things to add to your princess’ room to make it into her own private Kingdom. Now all you need to do is check out the appropriate page below to start purchasing what you need. Buying all of your Disney Princess bedroom solutions online will save you both time and money and if your princess is anything like mine was then saving both of these are pretty important! Both Barbie dolls and Disney Princesses are adored by girls the world over and so if you put them both together you create a must have gift idea for any little girl. Barbie Disney Princesses are great fun. Learn how to make the best Disney Princess Ariel room ever for your daughter. How to Make the Best Rapunzel Bedroom for your own little princess. If your daughter loves the story of Princess Tiana in the Princess and the Frog then creating a Princess and the Frog bedroom for her is something she'll love. Let's look at how easily you can create your very own Sleeping Beauty bedroom. Learn how to create a Snow White bedroom that will absolutely wow your own little princess. There's More Than Just Disney Princess Themes for Girls Bedrooms! Creating a girls bedroom can be a lot of fun and very rewarding when you see their face light up as they enter their own special kingdom for the first time.